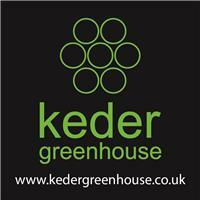 Keder Greenhouse Limited - based in Offenham, Worcestershire. Keder Greenhouse are the designers and manufacturers of high specification greenhouses made from bubble layered laminate plastic, which offer different benefits to traditional glasshouses or polytunnels. Our product is safe, strong, and durable and exceptionally energy efficient, we design and build for both the domestic customer and the commercial grower. We are known as the storm proof greenhouse, we regularly install in the Hebrides, Scottish highlands and Orkney Isles. We have been building greenhouses for more than 25 years. Based in the fertile Vale of Evesham, Colin Moore (MD, Owner, designer) as a grower himself, understands the need to nurture and protect crops from the elements, whilst extending the growing season. The Keder Greenhouse system is modular, so can be extended as customer needs grow. At Keder Greenhouse, we will not be beaten on our level of customer care. The whole of the UK and Ireland including all offshore Islands such as Orkney and the Hebrides.